Photo: Central section of Neraki with Aris and Myself at work! 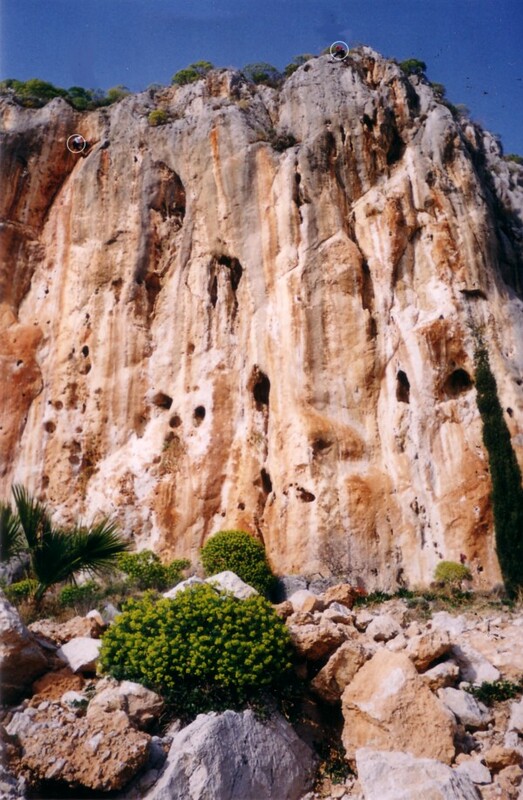 The main cliff of the Naplion area and a superb venue, a steep overhanging orange cliff with many holes and caves lying halfway between Naplion and Karathona Bay. A nice little bay and beach to swim after climbing. Ape, Chimp and Orangutan by J. Titt, the rest by A. Theodoropoulos and local climbers especially Thanos Sotiropoulos. S facing so very hot in the summer months but an excellent winter cliff. Note. The numbers on the photo do not correspond with the route numbers, for orientation you should know that route 14, Orangutan is numbered 22 on the topo, route 15, Rosso is numbered 24. (This is due to giving seperate numbers to the extension uppr pitches). I will try to improve these photos sometime. Routes from L to R.